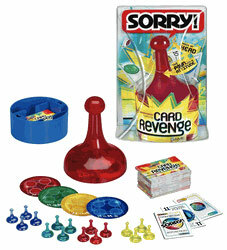 Takes the classic game of sweet revenge to the next level in an easy-to-learn, electronic card game edition. Players start with five cards and follow the directions from the host - a fast-talking, oversized, electronic Sorry pawn with an attitude - as they try to play out their hand of cards onto the discard pile. To discard, a player must match the card color, or play a sequence of cards in numerical order. When a player discards a Sorry card on an opponent, that player must tap the pawn, which will direct him or her draw cards or, if lucky, discard. The first player to play out his or her hand of cards onto the discard pile four times wins.